Some late swing with CAD pairs after New York session. It started quite slow but now picked up pace. At the moment of writing this, oil price hitting 43.18$ and continue to go up. Which is perhaps behind massive CAD moves. I was mentally prepared to close the shop with break even but then this happened. I actually read the pair as in range. however, since nothing was moving early NY session so i thought i want to take a chance. so i took a market order from a good area with 12 pips stop loss as you can see from above picture (Here i changed my stop loss to secure my loss). 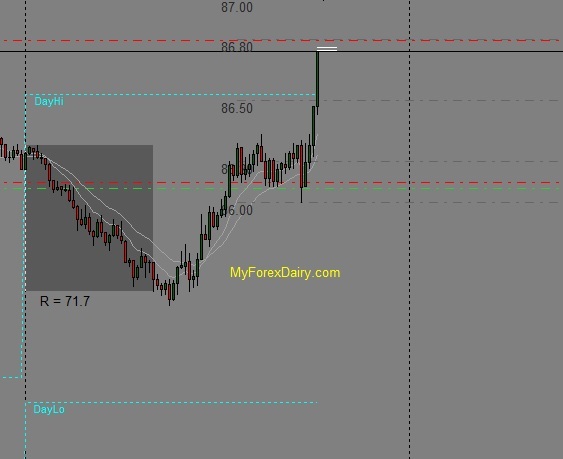 I ended up taking my profits at 86.80 which is +70 pips from my entry. Pretty happy with this. Meantime, i also took eurusd range break out with +20 pips but also lost some pips with gbpjpy and audusd total of -17 pips. This is the way i trade, lose some gain some. My gains are always more than 3:1 hence i could offset my losses. Although i don’t pay attention to fundamental much but little change in news helps me to identify which pairs i should keep an eye on.